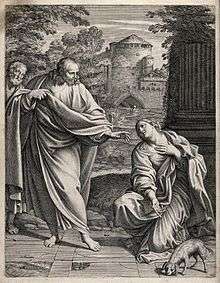 The Syrophoenician woman (Matthew 15:21) (also called "Canaanite" Mark 7:26) is an unidentified New Testament woman from the region of "Tyre and Sidon" (Matthew 15:21), whose daughter Jesus heals by exorcism. "The woman is ... described as Syrophoenician by race. It is unclear whether Mark seeks to distinguish between a Phoenician from Syria and one from northern Africa or between someone living in the costal area of Syria and someone living in the central part." Her other notable characteristic is her non-Jewish status: the Gospel of Mark adds that she is a gentile (Greek: Ελληνις Mark 7:26). ↑ Stein, Robert H. (2008). Mark. Grand Rapids: Baker Academic. p. 351. ISBN 9780801026829.